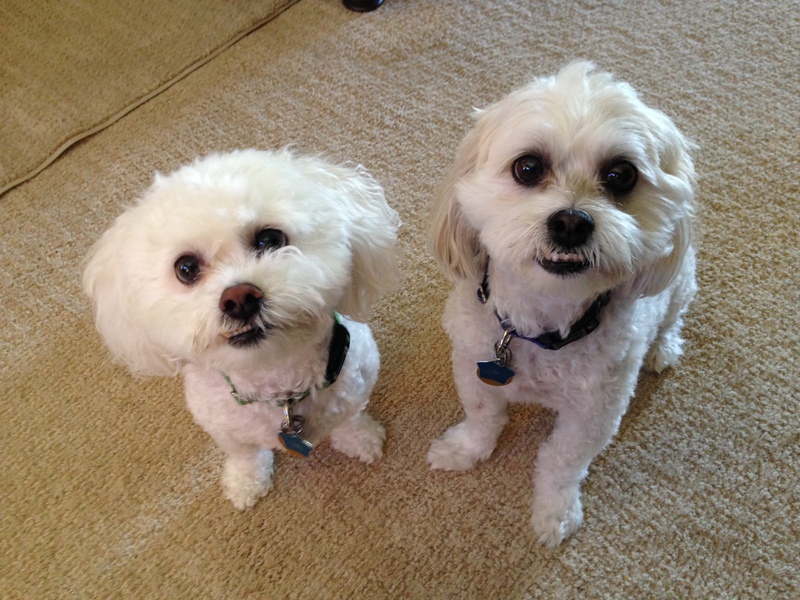 Riley and Gizmo are eight-year-old brothers who were adopted together as puppies. Their guardian called me to stop them from marking inside of the home. Whenever you have multiple dogs in your house, it’s common for the dogs to try to compete for the spot of top dog if their guardians have not implemented rules, boundaries and limits. As I was getting ready to explain this to their guardian, Gizmo literally climbed up and walked on top of her. When the guardian embraced the dog for doing this, I knew we had to change the leader follower dynamic in the home. Dogs go through life probing and waiting to be corrected. But if you don’t have any rules or limits, then you’re not going to be correcting your dogs very often. This can easily be misinterpreted by the dogs as a lack of leadership in the home. When the dogs don’t think that there is a leader, they attempt to nominate themselves. This was absolutely the case in this situation. I suggested a number of simple rules and boundaries to help the dogs start to see a difference between their authority and that of their guardians. One way to do this is to ban the dogs from climbing up on the furniture. Dogs feel a sense of authority based on how high they sit in comparison to the other members of the group. By making the furniture off limited, we can helot he dogs see a literal distinction between themselves and their guardians. Male dogs mark things that they feel or want to be theirs. When you have two rival males in the same area, they often mark over each other. This becomes a vicious cycle that quickly gets out of hand. I have found the best way to deal with the situation is to change the leader follower dynamic so that the dogs no longer think that an authority position is available; its taken by the humans. When the dogs see and identify themselves as a follower, it would be inappropriate to attempt to mark things that don’t belong to them. So by changing how the dog sees itself, we can put a stop to the marking. One of the simplest ways to achieve this is to literally have the dog in a follower position. Because these dogs had a tendency to race up the stairs and get under the foot of the guardians, I started out by showing their guardian how she could claim the stairs. I showed her how to communicate to the dogs that they were to wait for her to get to the top or bottom of the stairs before they were allowed to follow. In the course of practicing this exercise, it quickly became apparent that Gizmo had some insecurities. This was surprising to the dog’s guardian as she always identified Gizmo as being the top dog. I found that just like some humans who are insecure, dogs will sometimes lash out and attempt to bring others down to their level due to their own insecurities. It’s quite possible that Gizmo has been engaging in this behavior with his brother Riley for the same reason. As soon as we started to incorporate some rules and boundaries, Gizmo didn’t know how to process it. He dealt with this by walking away and positioning himself behind furniture, under the bed or behind his guardian. These are textbook examples of insecurity and lower self esteem. Because I wanted the dog to feel good about itself, I knew I needed to address this issue. I pulled out some high-value meet treats and then practiced a simple recall exercise with the dogs. Sometimes a dog’s insecurity isn’t as strong as its desire for a treat. Especially when there is only one treat and another dog. Not in this case. Riley was able to consistently come over and retrieve the treat before Gizmo had even figured out that we were calling the dogs over. It only took a couple of recalls before Gizmo started to look more self-assured; he was holding his head higher, he was no longer hunched over, he was giving good eye contact, responding quickly and had a little bounce in his step when he trotted over to whoever called him. In fact his Guardian may have had more problems with the recall exercise then the dog. At first she was repeating the command word over and over instead of just once. This is a bad habit that she had been practicing for years. But if we always repeat our commands to the dogs over and over, we’re communicating to the animal that it can obey us when they feels like it. I showed his guardian how do use several nonverbal cues to call the dog over. Your hand position, movement and the way you give the dog a recall command can all have a big impact on how well he understands. As we practiced, the dog’s guardian’s technique improved as did her timing. She needs to continue to work on this until it becomes second nature, but it was great seeing her recognize the difference that these minor changes made to her interaction with the dogs. Once Gizmos confidence was sufficiently built up, I let Riley off of the leash and then we practiced recalling the dogs together. This time both dogs were responding much better with a hint of competition working as a great motivator. I suggested that the dog’s guardian practice the recall exercise with Gizmo separately at first, but eventually with both dogs. Each time that they ask the dog to come to them and then rewarded for doing so, they reinforce the leader follower dynamic that is needed to stop the dogs from thinking it’s appropriate for them to mark things. To accelerate the change in the leader follower dynamic, I demonstrated a leadership exercise that I’ve developed to help dogs see and identify themselves as a follower, while also helping the human practice leading the dog. Because of Gizmos lower self-esteem, this exercise was too advanced for him to participate in soI focused on Riley. I ran through the exercise with him several times until he seemed to understand, then I coached his guardian through it until she got the same results. By the end of the session, the dogs were staying off the furniture on their own, were walking behind their guardian and obeying her commands the first time. This was a great first step, but the key is its one of many. Their guardians will need to consistently correct the dogs the instant that break a rule or boundary and practice the exercises often for a two to three week period in order the change how the dog’s see and identify as leaders. As their perception of self changes from leader to follower, the marking will decrease and eventually stop altogether.